French letter, English letter, Dutch cap ............... oh dear so many names to describe - a condom. And the hero had his helmet. There are according to one Internet site 5,000,000,000 condoms used a year worldwide. My first thought was, who has been given the job of counting them, but then that's me. More important from this site's point of view is that using a condom is not a new thing like some think. This is important because it means that many of the activities on the site related to love making or sexual stimulation could have been [and were] practised thousands of years ago. The first recorded [ as opposed to actual] use of a condom was around about 1000 BC. Condoms then were made of oiled silk paper, leather or very thin hollow horn. Then in the 15th Century an Italian doctor suggested that linen condoms could be used to protect against syphilis.Not far away from that, in France they began to use sheep guts as protection. 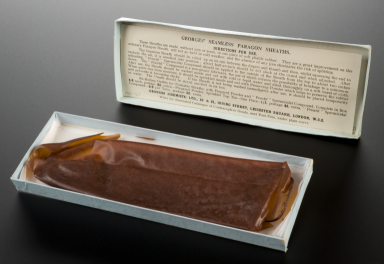 In 1855 rubber condoms were introduced, these could be washed and reused - until they crumbled and perished. And exactly 95 years later improved condoms, started to appear, like those in use today. Condoms became "thinner and tighter which decreased the risk of leaking and pregnancy".